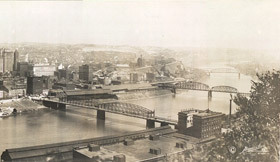 The P&LE (also known as Little Giant) was a railroad that connected Pittsburgh with Youngstown, Ohio. Opened in 1879, the P&LE carried tons (and tons) of coal, coke, ore, iron, limestone, and steel into and out of Pittsburgh’s steel mills. The passenger station was a busy meeting place for travelers; it’s now a historic landmark in Pittsburgh. 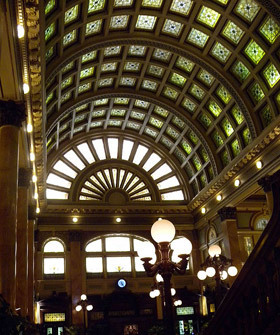 The passenger station of the P&LE Railroad is now home to one of Pittsburgh’s finest restaurants, The Grand Concourse. (Gorgeous place!) The restaurant is just one of many in Station Square’s 52-acre riverfront complex that also offers a comedy club, shops, and nightclubs.